When a camera has a dedicated "moon" mode, you know it has some serious telephoto power. By buying this product you'll earn up to 997 Rewards points. When a camera has a dedicated "moon" mode, you know it has some serious telephoto power. With 125X optical zoom, the Nikon P1000 boasts the most powerful lens ever used on a Coolpix camera — or any other camera that I'm aware of, for that matter. 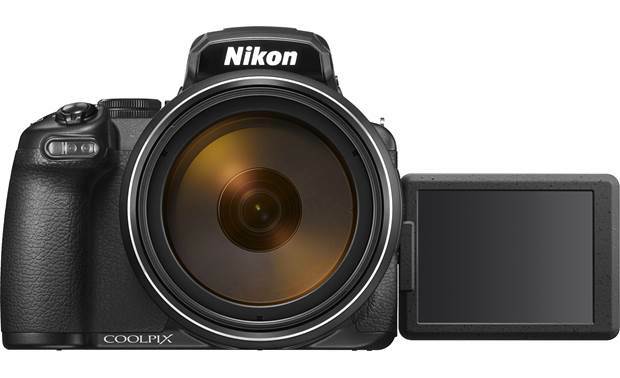 The Nikon Coolpix P1000 has a rotating LCD screen to help with composition from different angles. Nikon calls it "extreme zoom." This relatively compact "bridge" camera's impressive lens has a 35mm equivalent focal length of 24-3000mm, so it can cover a huge range of situations. And you aren't just limited to amazing captures of light-years-distant subjects — the P1000 can focus on subjects as close as one foot away for stunning, detailed macro images. 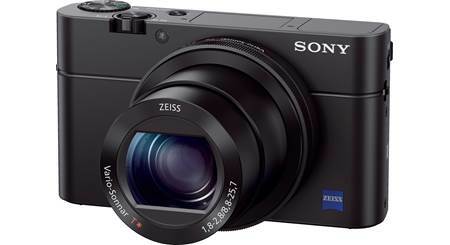 This camera offers easy, intuitive control for photographers on all levels. Automatic settings and scene modes make it a great starting point for creative development since they let you focus on getting your composition right. When you're ready to call the shots, you can take full manual control of the P1000. The P1000 uses a combination of features to give you sharp, blur-free photos. Nikon's Dual Detect Vibration Reduction system stabilizes both horizontal and vertical camera movement. The camera's grip-style body and large lens barrel let you hold it securely with both hands. And using the viewfinder to frame your shot lets you bring your arms in close for added stability. For even more precise results, take your hands out of the equation. Mount the P1000 on a tripod and use Nikon's SnapBridge app to turn your mobile device into a wireless remote. If you'd prefer a dedicated remote, the optional Nikon ML-L7 can trigger the shutter and control various other functions on the P1000. The P1000 records movies at up to 4K resolution. Built-in time-lapse and super-lapse recording modes instantly combine still images into awesome fast-motion footage. The camera's HDMI output allows recording and playback on an external monitor, and there's also an input for adding a microphone if you want to optimize the sound quality of your video creations. Very Heavy. I bought i for moon shots, so far I have not been successful in focus variables. I am using a tripod with stability disabled. I am not and expert so my comments should be qualified by the word "armature". Does this camera have an external battery charger? 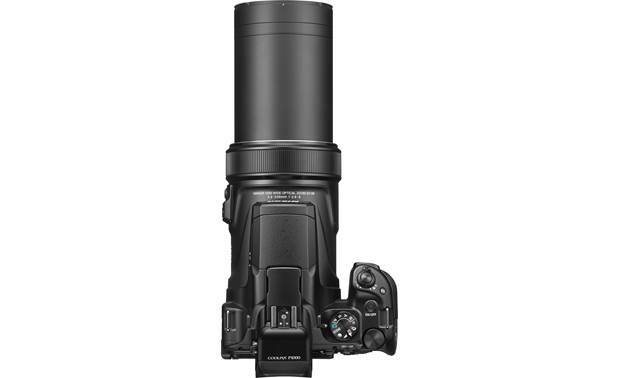 Overview: The Nikon Coolpix P1000 is equipped with a 24-3000mm zoom lens, the most powerful zoom lens ever used in a Coolpix camera. This one-of-a-kind Nikon camera is ideal for wildlife enthusiasts, birders, sports and travel, and astrophotography. There are special shooting modes for Moon photography and Bird-watching. 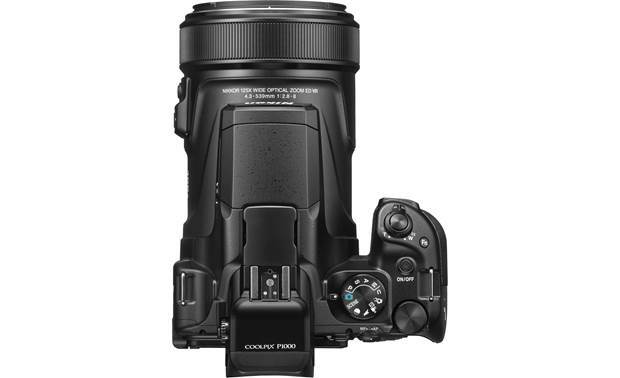 The Coolpix P1000 comes with a lens hood and shoulder strap. 125x Optical Zoom: The Coolpix P1000 digital camera is equipped with a 125x optical Zoom-NIKKOR ED glass lens for superb image quality. The lens has a focal length of 4.3-539mm that is equivalent to a 24-3000mm lens in 35mm photography. There are two stages of digital zoom: Dynamic Fine Zoom and full Digital Zoom. Dynamic Fine Zoom is approximately 2x the optical zoom value (up to 250x total) with little or no degradation of image quality. Beyond 2x, the full digital zoom enlarges the image up to 4x the optical zoom (up to 12000x), but with a noticeable reduction in image quality. When you move beyond the optical zoom range, the digital zoom is activated and the zoom indicator changes to blue (for Dynamic Fine Zoom), and then to yellow (for full Digital Zoom). When recording 4K movies, the digital zoom magnification is up to 3.6x. 3.2" Vari-angle LCD Monitor: The Coolpix P1000 has a 3.2" high resolution LCD monitor featuring approximately 921,000 dots, an anti-reflection coating and a 5-level brightness adjustment. 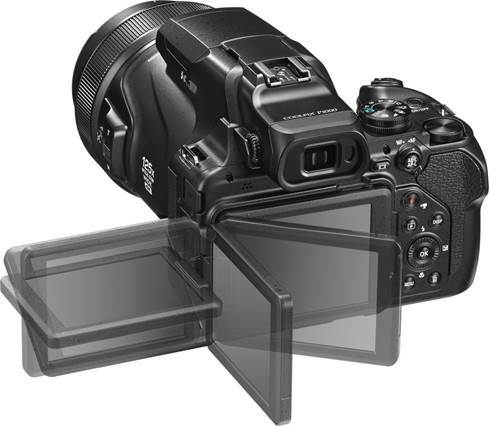 The LCD monitor has approximately 99% horizontal and vertical coverage in shooting mode and approximately 100% in playback mode. The Vari-angle display swivels out 180° and rotates 270° for high- and low-angle shots, as well as self-portraits. The monitor can be turned completely around and faced inward to protect the LCD screen when using the viewfinder only or when not in use. 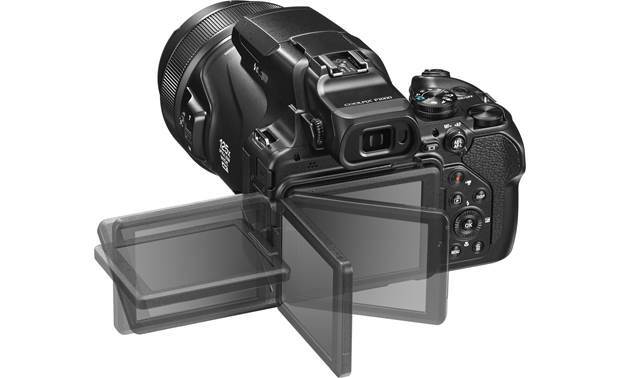 Electronic Viewfinder: In addition to the 3" LCD monitor, the camera has a 0.39" Electronic Viewfinder with approximately 2,359,000 dots. It has approximately 99% horizontal and vertical coverage in shooting mode and approximately 100% in playback mode. The EVF has a diopter adjustment to allow you to set the image to your eyesight. 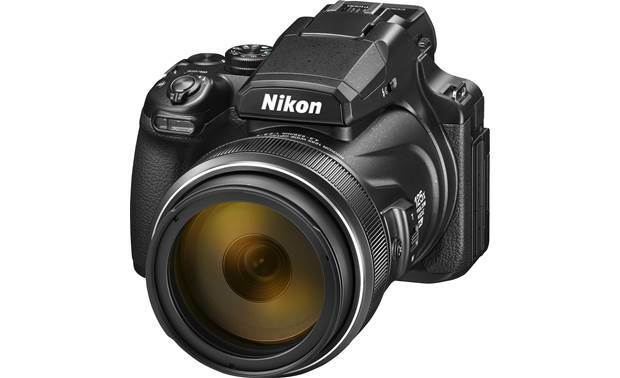 Image Sensor: The Coolpix P1000 features a 1/2.3" CMOS image sensor with approximately 16.79-million total pixels and 16.0-million effective pixels. Recording Media: Images can be recorded onto SD, SDHC, or SDXC Memory cards, including UHS-I compliant cards. When an SD Memory card is inserted in the camera, the images are automatically recorded onto the card. Memory cards with an SD Speed Class rating of 6 or faster are recommended for recording movies. When recording 4K UHD movies, cards with a UHS Speed Class 3 or faster are recommended. Zoom Memory: When the zoom control is operated, the zoom stops at the following preset focal lengths: 24mm, 28mm, 35mm, 50mm, 70mm, 85mm, 105mm, 135mm, 200mm, 300mm, 400mm, 500mm, 600mm, 800mm, 1000mm, 1200mm, 1400mm, 1600mm, 1800mm, 2000mm, 2200mm, 2400mm, 2600mm, 2800mm, and 3000mm. The function is similar to having 25 different prime lenses on a DSLR camera. You can select any or all of the presets in the menu. (Zoom Memory is only available in the P, S, A, M, or U shooting modes.) You can set the camera to a specific Startup Zoom Position in advance (24mm, 28mm, 35mm, 50mm, 70mm, 85mm, 105mm, or 135mm). Zoom Controls: The camera features two separate zoom controls. One is located on the top surrounding the shutter release to be controlled by the right hand. The other is located on the left side of the lens barrel, for operation of the zoom by the left hand. A Snapback Zoom Button, on the left side of the lens barrel, that lets you quickly zoom out to recapture distant subjects that may have moved out of frame. When you release the button, the lens snaps back to the previous zoom position. Dual Detect Vibration Reduction: The Coolpix P1000 offers Dual Detect Vibration Reduction (VR) image stabilization to reduce blurring caused by camera shake when shooting. The camera automatically detects the panning direction (horizontally or vertically) and compensates for camera shake by shifting the lens. For still images, the camera uses the lens-shift method of vibration reduction. For movies, a combination of lens-shift and electronic VR is used. There are four modes of VR to choose from: Normal, Active, Normal (framing first), and Active (framing first). The level of compensation for Normal and Active is higher than that of Normal (framing first) and Active (framing first). Control Ring: The camera features a smooth operating control ring near the end of the lens. You can assign a specific function to the control ring so you can change the settings without having to pull the camera away from your eye. Options include Exposure Compensation, ISO Sensitivity, or White Balance. Built-in Wi-Fi + Bluetooth/Nikon SnapBridge: The Coolpix P1000 has built-in Wi-Fi and Bluetooth, which allow you to wirelessly connect the camera with your smartphone or tablet. Through the wireless connection and the Nikon SnapBridge app, you can automatically load photos and videos to your device as you take them, use your smart device to remotely take photos on the camera, or download existing pictures from the camera's memory card to your device. Once you have downloaded images to your smartphone, you can share them via email, texts, or social networking sites. Note: The Nikon Snapbridge app is compatible with devices running Android 5.0 and up, or iOS 10.0 or later (iPhone, iPad, iPod touch). RAW Images: RAW image data from the image sensor are saved without additional processing. RAW images are recorded in Nikon's own format RAW (NRW). RAW images cannot be processed in the camera. 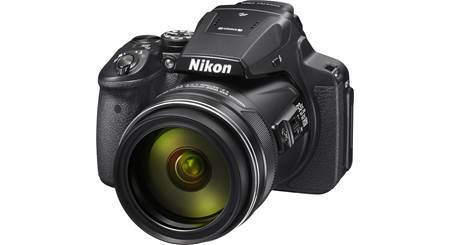 You will need to install Nikon ViewNX-i software on your computer to view, edit, and convert the images to JPEG or another format. If desired, you can capture one RAW image and one JPEG image (in Normal or Fine compression) simultaneously. When shooting RAW images, the image size is set to 16M 4608 x 3456. Programmed Auto Mode (P): The Programmed Auto Mode is a simple point-and-shoot mode in which the majority of camera settings are controlled by the camera. The camera will automatically set the shutter speed and aperture. This mode is recommended for most situations. Shutter-Priority Auto Mode (S): The Shutter-Priority Auto Mode allows you to choose the shutter speed and lets the camera select the aperture value for best results when freezing or blurring motion. Aperture-Priority Auto Mode (A): The Aperture-Priority Auto Mode allows you to choose the aperture value and lets the camera select shutter speed for best results when using to blur background or bring both foreground and background into focus. Manual Mode (M): The Manual Mode allows you to control exposure by adjusting the shutter speed and aperture manually. User Setting Mode (U): Settings that are frequently used for P, S, A, and M shooting modes can be saved in the User Setting Mode. The saved settings can be immediately retrieved for shooting by simply rotating the mode dial to "U". Creative Mode: The Creative Mode lets you apply up to five types of effects while shooting: Light (Dream, Morning, Pop, Sunday), Depth (Somber, Dramatic, Silence, Bleached), Memories (Melancholic, Pure, Denim, Toy), Classic (Sepia, Blue, Red, Pink), or Noir (Charcoal, Graphite, Binary, Carbon). Scene Mode: You can select Scene Auto Selector to let the camera choose the appropriate scene setting, or manually select one of 21 scene modes: Portrait, Landscape, Sports, Night Portrait, Party/indoor, Beach, Snow, Sunset, Dusk/dawn, Night Landscape, Close-up, Food, Fireworks show, Backlighting, Easy Panorama, Pet portrait, Soft, Selective Color, Multiple Exposure Lighten, Time-lapse Movie, and Superlapse Movie. Moon: Lets you capture images of the moon in a telephoto position. Bird-watching: For capturing images of birds in a telephoto position. Continuous L: Up to 200 pictures are shot at a rate of about 1 frame per second each time the shutter button is held down. Image size is set to 16M: 4608 x 3456 pixels. Auto Focus: Camera automatically adjusts the focus. Focusing distances: 1' to infinity (W), 23' to infinity (T). AF-Assist Illuminator: If lighting is poor, the AF-assist illuminator may light to assist the focus operation when the shutter-release button is pressed halfway. The illuminator has a range of about 16' at maximum wide angle and about 22' at the maximum telephoto position. You can turn this function on or off. Exposure Bracketing: The exposure can be changed automatically during continuous shooting. With Exposure Bracketing, the camera takes three images, one at the set exposure, one overexposed, and one underexposed. You can set the compensation interval to +/-0.3, +/-0.7, or +/-1.0. 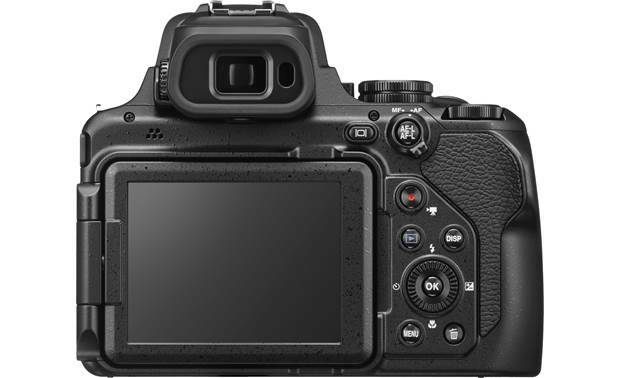 Auto: Sensitivity is set to ISO 100 when there is sufficient lighting, and raises the sensitivity to a maximum of ISO 1600 when lighting is dim. In Movie Manual mode, the range is ISO 125-1600. Fixed Range Auto: Select from two ranges in which the camera automatically sets the sensitivity: ISO 100-400 or ISO 100-800. In Movie Manual mode, you can choose ISO 125-400 or 125-800. Manual: Sensitivity is locked at the set value: ISO 100, 200, 400, 800, 1600, 3200, and 6400. Minimum Shutter Speed: You can choose the shutter speed at which ISO sensitivity starts to be automatically adjusted when shooting in P or A mode. If the exposure is insufficient with the set shutter speed, the ISO Sensitivity automatically increases to obtain the optimal exposure. 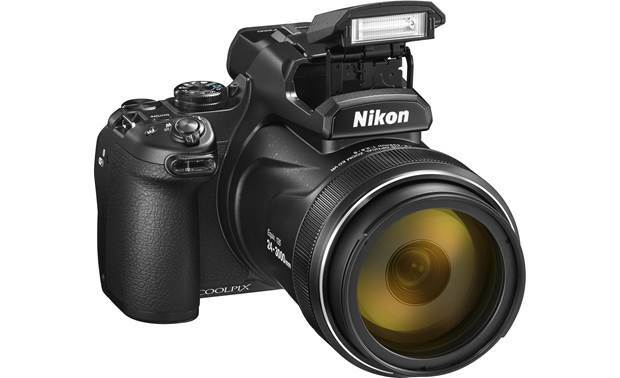 Accessory Shoe: The Coolpix P1000 has an ISO 518 Accessory Hot-shoe with sync and data contacts for use with Nikon Speedlights (external flash units) or microphones. Optional Speedlights SB-5000, SB-700, or SB-500 can be used on the camera. If an external microphone is used, you can adjust the sensitivity of the microphone manually or automatically. When the Accessory Shoe is not in use, you can attach a BS-1 Accessory Shoe Cover (sold separately from the manufacturer) to protect the contacts. 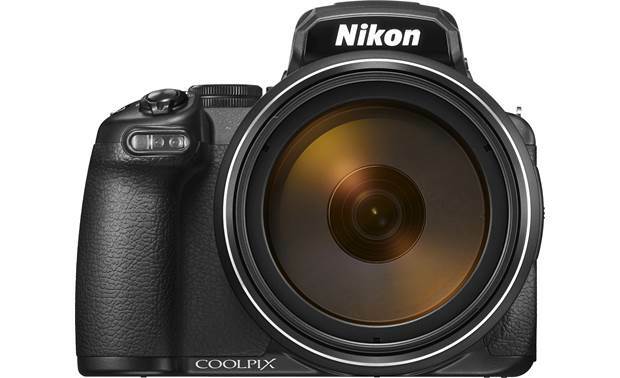 Other Options: Nikon offers two accessories specially designed for the Coolpix P1000. The DF-M1 Dot Sight attaches to the camera's hot shoe, and helps you acquire distant objects by acting as a wide-angle targeting device. You can line up your subject in the Dot Sight in a normal field of view and maintain sight of it even at extreme magnifications. The ML-L7 wireless remote control lets you zoom in or out, change the aperture or ISO settings, start movie recordings or shoot still images without touching the camera. It connects wirelessly via Bluetooth and is extremely helpful when shooting from a tripod. Mark for Upload: Still images stored in the camera can be selected in advance before transferring to a smart device via Wi-Fi or Bluetooth. 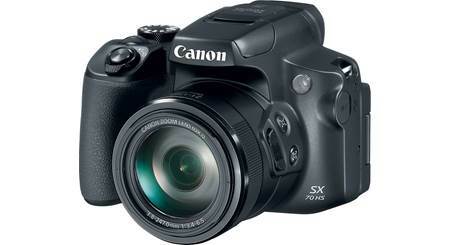 Power Requirements: The Coolpix P1000 is powered by a supplied rechargeable Lithium-Ion battery (EN-EL20a). The battery is charged using the supplied EH-71P Charging AC adapter. The supplied rechargeable battery will last up to approximately 250 still image shots or 1 hour 20 minutes of movie shooting on one charge. A fully-exhausted battery charges in about 3 hours using the supplied EH-73P Charging AC Adapter. You can also charge the battery in the camera in about 3 hours 30 minutes when it is connected to a computer via USB. HDMI: The Coolpix P1000 is equipped with a Micro-HDMI (Type D) output, allowing you to connect the camera to an HDTV. Movies recorded in 4K can only play back on 4K-compatible TVs. ViewNX-i: ViewNX-i enables you to transfer images and movies to your computer for viewing and editing. Capture NX-D: Capture NX-D is Nikon software that enables you to fine-tune photos or change settings for NEF (RAW) pictures and save them in other formats. Does an open box product retain the full manufacturer's warranty? This looks good. In doing a bit of research I came across this camera with a designation of International model. What is that about and is the warranty on your camera from Nikon? I believe so, Crutchfield, Nikon Coolpix P1000 accessories should do the trick. 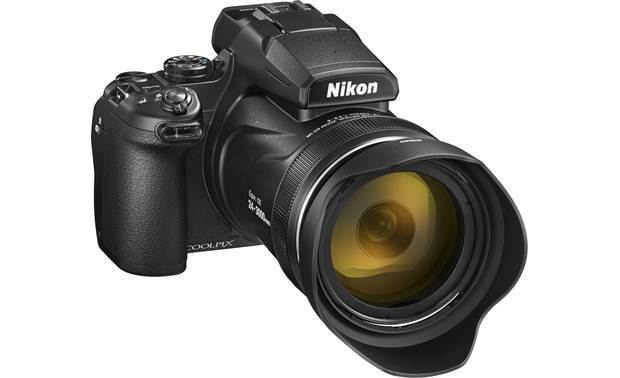 Searches related to the Nikon Coolpix P1000 16-megapixel camera with 125X optical zoom, Wi-Fi® and Bluetooth®.